Gates are used to provide access to or egress from a specific area along a conveyor line for personnel, equipment or lift trucks. The gate can be raised or lowered by an operator grabbing lift handles and picking up the gate, lock the gate with a safety latch while up and gain access to or egress from the area. Manual gates are used to gain access to or egress from an area. 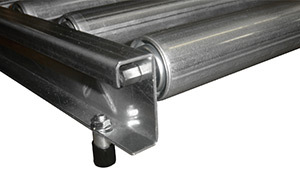 Manual gates are hinged to an adjacent conveyor, have handles for raising or lowering the gate, a hinged mechanism for manually pivoting the gate, a safety latch and can weigh no more than 75 pounds. Gates are available in 1” increments from 9” to 51” between frames. Spring balanced gates are used to gain access to or egress from an area. Spring balanced gates are hinged to an adjacent conveyor, have handles and springs to counter balance and assist in raising or lowering the gate. Gates are available in 1” increments from 9” to 51” between frames.